Elegant living rooms display fine design without appearing flashy. And it’s harder than it sounds. This living room in the home of Washington, D.C., designer Skip Sroka reaches the pinnacle of elegant traditional design with gentle curves on the window treatments and furniture. Both chairs and the sofa have beautifully rolled arms as well as subtle curves at the back. The windows are adorned with curved Roman shades in a damask tone-on-tone that underlie simple pleated silk panels. All together, the curves convey a shapely beauty that ties the room together. This is the essence of soft decorating. The coffered ceiling and quiet palette continue the understated charm. This fireplace view of designer Skip Sroka’s Washington D.C. living room reveals more of his secrets to creating an elegant space. The gold-leaf mirror above the fireplace is ornamented with a Greek-key motif, the grandfather of classic patterns. (Think the opposite of trendy.) The mirror does more than introduce classic lines, however. It also swings out to reveal a flat-screen TV. This kind of cleverly concealed hard-working function provides one more clue to the meaning of elegant decorating. Efficiency. (Apple products’ efficiency makes them the most elegant in their industry. The same rules apply to both interior and industrial design.) The entire fireplace presentation is refined through the symmetrical balance of the mirror between a pair of antique sconces. Tip: Repeat motifs to knit a space together. The border design on this living room’s rug recalls the angles of the mirror’s Greek-key pattern. A surfeit of square footage thankfully is not essential to an elegant design, as this cozy living room in the Atlanta home of designer Lori Tippins proves. In fact, the human scale of the space contributes to its elegance, for design is as much about how a space lives as it is about how it looks. Here beauty begins with the bones of the room. 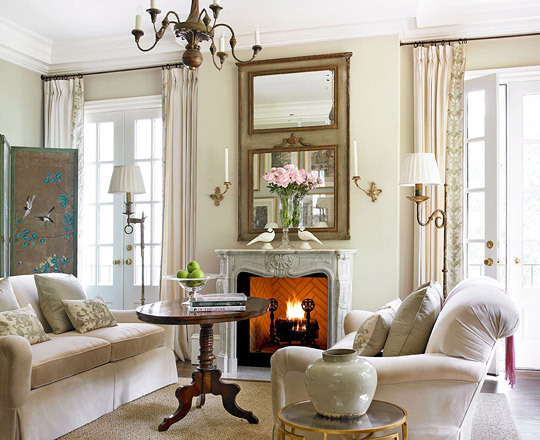 Pairs of French doors flank a small antique marble fireplace for a full flow of natural light, symmetrical balance, and pleasing proportions. The trumeau above the fireplace is a major player in getting the right proportions, drawing the eye all the way up to the same height as the curtain rods. (It’s also gorgeous!) These, too, are placed high on the walls, nearly a foot above the doors to skim just beneath the extra-thick crown moldings. Decorative elements are few but fine. The pair of floor lamps, for instance, were converted from gilded iron candlesticks. The vertical border on the draperies introduces color and pattern in an exquisitely subtle fashion. In New York’s renowned Kips Bay Decorator Showhouse, designer Noel Jeffrey went against trend by allowing the living room’s original dark-stained woodwork to have its say. And it is the language of elegance. By not painting the lovely paneled walls and fireplace, Jeffrey allowed the space to bask in the warmth of the wood’s rich grain. He underscored that warmth with creamy furniture upholsteries, a white rug, and billowy beige silk draperies that ensure a dramatic contrast between dark and light. Inspiration for the bright white living room in this Seattle home was the Hamptons house of Diane Keaton in the movie Something’s Gotta Give. That clean, almost effortless look of the movie’s beloved home actually is as sophisticated as it is simple. As interpreted here, it’s a crispness that emanates from the architecture. A deeply coffered ceiling works in tandem with the careful gridwork of shelving that flanks the fireplace to define the space in bold, linear strokes. Symmetrical balance extends to both the architecture and the clean-lined furniture to impose formal structure on an informal, feel-good style. So just two words to remember: clean-lined and balanced. When sophistication is the design goal for a seaside home, it pays to pause before bathing the living room in blues. 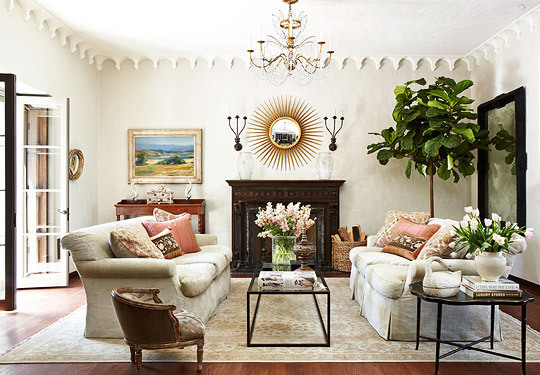 “You have to test them to discover the ones that read sophisticated and not silly,” says designer Jack Fhillips, who did precisely that in the living room he designed for the Shippan Designer Showhouse in Stamford, Connecticut. A pale, almost Prussian blue painted on the walls reads as Old World elegant, especially brushing against white-painted dentil crown moldings. A white silk tufted sofa commands the conversation area with a formality that’s made approachable by a pair of comfy blue club chairs. The large living room in this DC Design House (Washington, D.C.) exudes elegance with a deftly played palette that keeps all parts of the space in harmony. A tasteful mix of icy blue, ivory, yellow, white, and khaki creates the polished look. A large table in front of the fireplace divides the space into two conversation areas, and its yellow-and-white cotton striped skirt introduces a sunny spirit that’s essential for a room so large to feel livable. Matching sisal rugs define both sides of the room, and their Greek-key edges are banded in yellow to plant the palette underfoot. Making the right decorating decision sometimes means doing nothing at all. When a living room like the one in this East Hampton house is blessed with beautiful French doors and an abundance of light, a smart designer knows to leave well enough alone: Keep the windows undressed. Designer Larry Laslo did just that. He also enhanced the architecture’s airiness with a monochromatic palette of soft pearl and sand with dark wood accents. So can a living room be elegant and edgy all at once? The Honolulu home of designer Marion Philpotts Miller suggests the answer is yes. Certain stately furnishings like a grand piano are fixtures of finery, and music-loving Miller is a fan. But she’s an equally avid supporter of visual arts including those with a modern bent. The living room’s lavender pod chandelier adds an edgy layer of complexity to the room’s design, making it as interesting as it is elegant. Used as both a family room and a living room, the 20x30-foot space in this Atlanta home gathers its elegant energy from patterns that are even more subtle than tone-on-tone—they’re created entirely from textures. The pair of modified wing chairs at the fireplace are covered in a beige fabric woven in small diamond motifs (no coincidence, the Pollack fabric is “Diamondieu”). Then look inside the fireplace. The brick firebox is laid in a herringbone pattern. Subtle. The fauteuil facing the fireplace is a taupe velvet cut to create a 3D swirl pattern. And both the sofa and the club chair opposite it play the texture game with their small-weave diamonds. With the exception of the decorative pillows, the only non-textured pattern is at the windows. A tone-on-tone. Quiet. Elegant. Dove gray and attention to detail create serene sophistication in the living room of this Connecticut home overlooking Long Island Sound. “I didn’t want a beachy home so we went with dark floors and classic details,” says the owner, architectural designer Louise Brooks. Farrow & Ball’s “Skimming Stone” is painted on the walls, while the wood comes clean in the venerable paint company’s “All White.” Silver-gray cocktail and side tables pick up the thread of color from the room’s gray-and-white striped Elizabeth Eakins rug, while the furniture remains calm in white upholstery fabrics. Even the accessories on the fireplace wall’s shelves are pared down for importance. Most notable is the pair of antique lanterns on the middle shelves. Along the history-conscious East Coast, the living room of an Oyster Bay, New York, home in which George Washington really did sleep (during a 1790 visit) had a lot to live up to. So when designer Sallie Giordano bought it as her family’s weekend retreat, one of her overarching impulses was to honor its age. (The Long Island house was built in 1651.) For the living room, that meant glazing the walls in a multi-layer gray plaster finish that looks like it’s been there since the founding father’s sleepover. “It resembles old plaster that’s been painted many, main times,” says the designer. The striated finish adds depth, patina, and a sense of history. And those add up to elegance. Who better than furniture designer Bob Williams to master the modern mix? In the living room of his home in Hickory, North Carolina, the cofounder of furniture manufacturer Mitchell Gold + Bob Williams pairs his new designs with vintage favorites from the mid-century. His eye for quality is revealed in his treasured old Lucite chair, Eames-style white leather armchair, and Frank Gehry cardboard chair, all of which mingle with his own clean-lined designs. Traditional toile draperies from Duralee and ice-blue walls set off the elegant mix. Venetian plaster walls and antique beams give this new Atlanta home the sense of history that figures so prominently in elegant Southern style. Gracefully turned-wood furnishings including a fainting lounge (what’s more Southern than that?) join posh but soothing fabrics to increase the elegance. Window treatments are important in the South, and these full panels hang ceiling to floor. But the palette of dreamy cream and taupe with accents of blue and chocolate ensures that all is easy on the eye, an imperative for true elegance. Interior Design: Heather Dewberry and William C. Huff Jr.
A single glance at the living room of this 1928 Mediterranean Revival in Los Angeles—even without furniture—was enough to announce the home’s elegance. The room’s original scalloped plaster moldings were a decorative feature architect Gordon B. Kaufmann brought to his early Hancock Park commission. Designer Mark Williams respected the original features, which include the fireplace, with quiet furnishings in creamy neutrals. “Kaufman kept the details rather spare so that the interiors feel tranquil rather than overly ornate,” he says, summing up all of elegance. In the same Hancock Park house you just viewed, the other side of the living room portrays elegance on a much grander scale. Here the room’s original double-decker wall of leaded-glass arched windows soars tall and airy, overlooking the garden. Still, there’s nothing ornate in the design. The elegance lies in the arches—pure and simple beauty. Get more ideas for your living room in Decorating Ideas: Unique Living Rooms.